Dr. Fisher and his team will use an FDA-cleared spinal cord stimulator to send electrical pulses to the dorsal root ganglia (DRG) and dorsal rootlets (DR) in hopes of reducing PLP. The stimulation creates sensations of pressure and movement in the amputated limb, thereby reducing PLP and improving prosthesis functionality. The team will be using pressure sensitive insoles and joint angle sensors in the prosthetics. Dr. Fisher explains, “The insoles allow us to control stimulation. If we record increased pressure under the ball of the foot, we will increase stimulation for an electrode that generates a sensation at the ball of the foot. 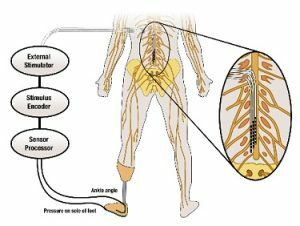 The goal is to make it feel like the sensations are coming from the prosthetic limb.” The study of these signals and modulation of sensory feedback through DRG/DR stimulation should improve movement by decreasing postural sway and increasing gait stability.